Flu season is in full swing, surrounded by germs and illness, SSA Ellie Iverson reacts like any new mom, with hand sanitizer at the ready and a desire to keep away from anti-vaxers. Her newly hatched germaphobia escalates when Delta A is asked to investigate animal rights activists and a missing laboratory monkey. An incident in Lexington, Virginia leaves the Director of the FBI fighting for her life. A sudden violent death of a colleague in Washington, the discovery of a spate of deaths linked to the Intelligence Community, herald the arrival of an old friend from the UK with news of a potential global disaster. With biker gangs, drugs, grudges, and a plethora of ‘accidental’ deaths in the mix, this is no ordinary flu season. Special Agent Ellie Iverson (nee Conway) from Delta A, an elite force within the FBI, gets involved in disparate cases – the links between which are a bit of a puzzle: Her FBI Director Cait O’Hare has been killed, as have heads of various intelligence agencies, and the Trump administration’s isolationism makes working with overseas colleagues a bit tricky. Then there’s the kidnapped monkey, and the hit and run of the Assistant Secretary of the Bureau of Intelligence and Research, who had managed to sneak out a file hidden in a song that talked about the theft of a mysterious infectious agent, and the proof is in the contaminated bottled water that has been distributed to high-end hotels. Delta A is a close-knit team, extremely professional, prone to cutesy nicknames, and with an ESP link that could be the result of long-term familiarity, or not … Ellie has a form of lexical synaesthesia, where she doesn’t taste words but sees them floating, crawling, slinking … and she is also in the habit of seeing yellow fluffy ducks and visualising metaphors. Oh, and her most useful brain-storming partner is an imaginary friend. We see the world through her brain. Ellie has a knack (with some spooky help) of solving riddles and codes, the biggest riddle is whether the death of her friend and boss, Cait, is connected to the other killings, and whether all of the killings are connected to the clear and present danger of the biological threat. 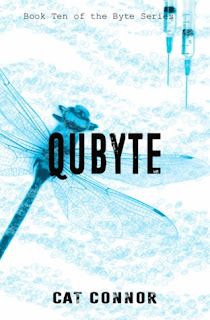 QUBYTE has a curious ending, where at least one mystery is solved with a very mundane solution but the others? … “Pollyanna has left the building” and we might need to wait for the next Byte to fully understand the mystery. An exciting and intriguing read.